The scholar of book history Otto F. Ege disassembled works from his personal collection of medieval manuscripts to create forty portfolios of fifty leaves each, offering these sets for sale to individuals and institutions under the title "Fifty Original Leaves From Medieval Manuscripts." Marketing his portfolios as a resource for study of the history of the book, book illustration, and paleography, Ege justified his biblioclastic enterprise as a means of sharing the beauties of Medieval books with a wider audience. 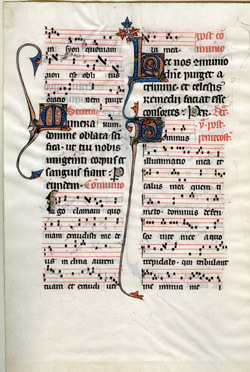 The majority of the texts scavenged for Otto Ege's "Fifty Original Leaves From Medieval Manuscripts" (all but one in Latin) are liturgical in origin -- Bibles, psalters, missals, breviaries, and Books of Hours -- however Ege also included a few less common works such as the 15th-century manuscript of Livy's History of Rome and a version of Thomas Aquinas's Commentary on the Sentences of Peter Lombard. The leaves range in date from the late twelfth to the early sixteenth century and represent a number of distinctive regional styles in paleography and illumination from throughout western Europe, including Italy, France, Germany, the Low Countries, Switzerland, and England. The UMass Amherst copy is number six of 40.